Not even into her junior year the University of Massachusetts, Rebecca Duke Wiesenberg has already held a variety of positions at the student-run paper, the Massachusetts Daily Collegian. She’s been an op-ed writer, a copy editor and the assistant news editor in the short time since she joined the paper. But it’s her current title that may be her most impressive. 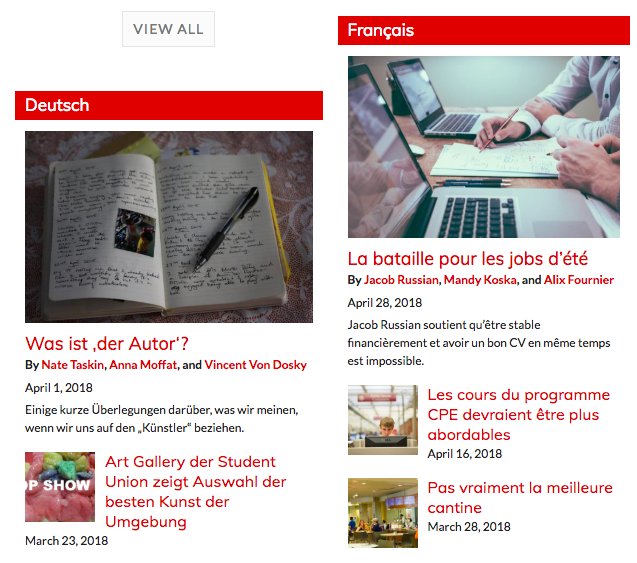 Duke Wiesenberg is the paper’s first translations editor and she’s creating a section of the website that offers stories translated into eight different languages – Spanish, Portuguese, Chinese, Vietnamese, German, French, Italian and Korean. The idea was born last Fall; with a large international population on campus, especially among the graduate students,Duke Wiesenberg had wondered why the Collegian was only providing stories in English. Why not translate them? she had asked. The new idea comes during a year when the Collegian has transitioned from focusing on print to digital. Though it was a Monday-through-Friday paper as little as five years ago, due to financial struggles, the Collegian now only prints a paper twice a week. That means focusing more on providing a strong online product. Translated stories are part of that and it made sense for Duke Weisenberg to do it; she’s a double major in linguistic anthropology and journalism, with a minor in Chinese. Translating news stories for foreign readers is, of course, nothing new. The New York Times offers a translation option to its readers online, frequently providing Spanish and Chinese translations of their stories. It not only translates stories into those particular languages, but also specifically posts stories pertaining to countries that use those languages. 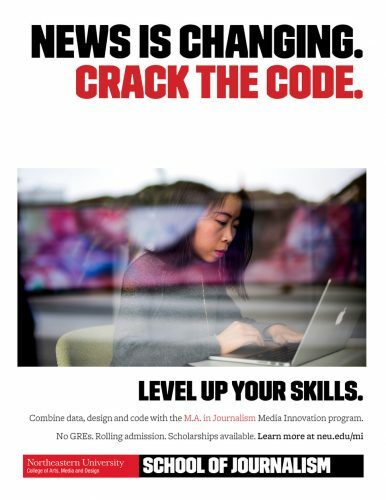 Could a college paper do the same? 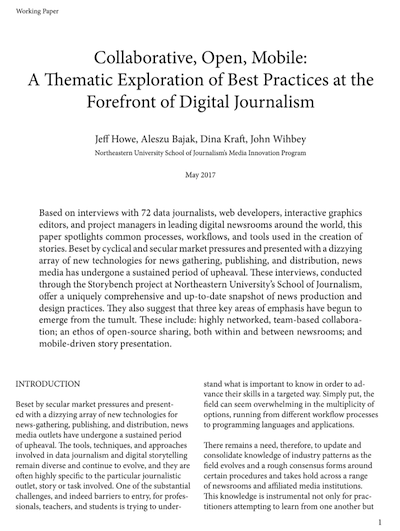 When looking into the Collegian’s plan to translate stories, Duke Wiesenberg researched other college publications and only found one other website – a paper at a small college in Hawaii that offered translation services. And, in that case, the outlet translated from the native island language to English, having the inverse effect to what the Collegian offers. Through her contacts with the heads of all the foreign language departments at UMass, Duke Wiesenberg has compiled a small army of translators to make sure the translations pass muster. There are currently 16 translators on staff, with Spanish having the most translators at three people. Each staff member is responsible for translating one article per week on an assigned day that they feel is worth translating into their designated language. While it doesn’t provide a steady stream of constant content updates, it’s something to broaden the website’s reach to new readers that otherwise wouldn’t be there. 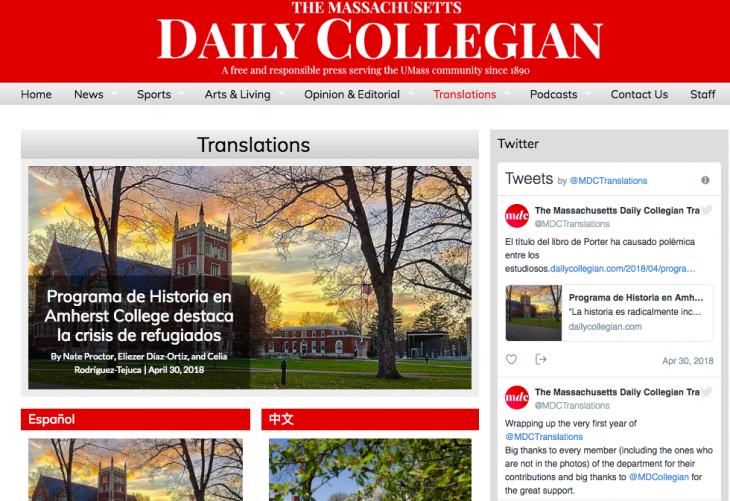 The Collegian offers eight other languages besides English – and it’s still looking to add more. Duke Wiesenberg said that if someone shows interest in translating into a language not already offered, she’ll gladly hire that person and add the language to the tab. In fact, Duke Wiesenberg is planning to bring on Russian and Haitian Creole translators in the near future. Having a translation section certainly requires the resources that most news outlets don’t currently have in today’s climate. But, as the country becomes more diverse, especially on college campuses, offering translations serves multiple purposes, a trend that might take a few years to catch on, but one in which the Collegian is ahead of curve. 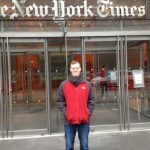 Patrick is a graduate student at Northeastern’s School of Journalism.